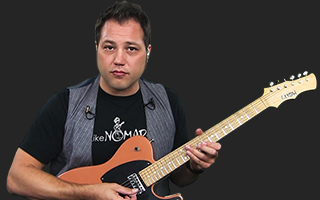 Theory and Improvisation Guitar Lesson: Learn the Notes! Home > Guitar Lessons > Skill Building > Theory and Improvisation > Nomad's Modal Magic Show > Learn the Notes! Before getting too deep into the modal mysteries, Nomad lays down some groundwork. Before you can use the modes, you need to know the notes on the fretboard! Nomad offers up a simple drill to get everyone on the road to note memorization! You have a teaching gift! This really motivates to learn all the notes on the fretboard. Love your enthousiastic teaching style!